This magnetic game is very easy and practical to take with you wherever you go. 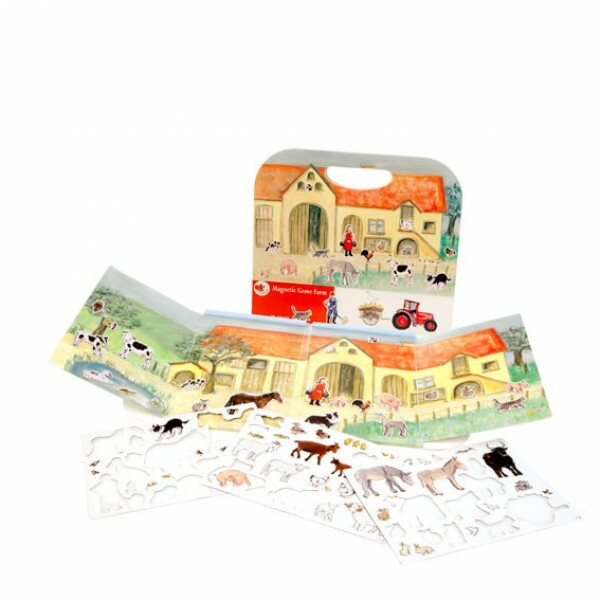 The fold-up case with handle opens to form a farm play scene. It comes with a variety of detachable, magnetic pieces to complete the farmyard and provide lots of opportunity for imaginative play. Manufacturer's recommended age - 3 + years. Not suitable for children under 3 years - small parts, choking hazzard. To make a purchase just browse our storeand add any items that you wish to buy into the shopping cart. After you have finished, check your basket to make sure you haven’t missed anything, and proceed to 'Checkout'. You will be asked for a few details that we need to be able to complete the order. We currently use PayPal to process our orders online. You do not need an account with PayPal to process your order.Once payment has been received, your order will be shipped. We use Royal Mail for the majority of orders. To assist our customers we try to keep shipping costs as low as possible, whilst maintaining a quality service. Standard UK Delivery - £1-95 - 3-4 days. This lower charge applies to most items on our website. Heavier Items £2-95 – 3 – 4 days. This charge (just £1-00 more applies to heavier items eg wooden playsets and multiple item orders. Please note all orders over £80-00 in value will be delivered free of charge. Please order before 12.00 noon to secure actual delivery on the next day. For delivery charges to Europe or the rest of the world please contact us for prices. Important Information - Please ensure that your delivery address details are correct when submitting your order online. Orders should take no more than 5 working days to arrive. If your order has not arrived, please call us on 07452 952011 or email sales@pennybobbintoysandgifts.co.uk and we will do our best to assist you.